This is the elegant "Goddess" that graced the long art deco lines of the 1933 Cadillac "Sixteen". She proudly commanded the road, propelled by a bold and powerful 452 cubic inch V-16. 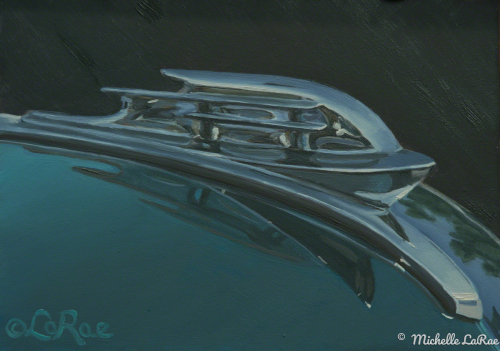 This abstract tall ship "Mayflower" is found on the hood of a1953 Plymouth Cranbrook. The ship's new sleek lines lent an aura of speed to the new straight lined Plymouth. As a sales ad stated, "The Plymouth has been so named because its endurance and strength, ruggedness and freedom from limitations so accurately typify that Pilgrim band who were among the first American colonists." 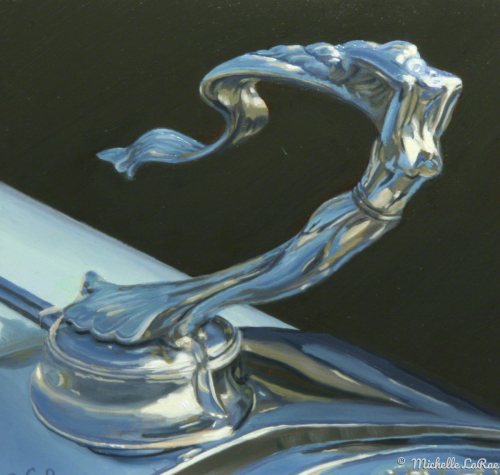 The "Cormorant" was an iconic hood ornament for Packard, which was renowned for high end American luxury cars. In 1934 this Cormorant glided though the air atop a long elegant hood, propelled by a straight 8 or "Twin Six" 12 cylinder engine. 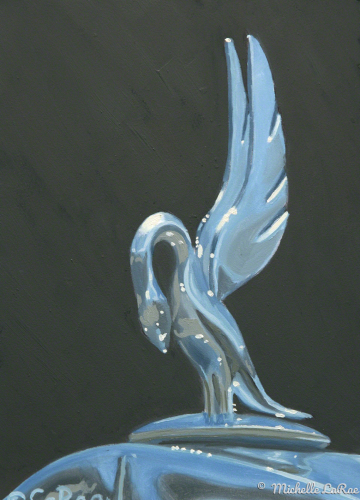 The Cormorants flight is a reminder of a time when talented hand crafted workmen were still used for luxury automobiles. Cadillac introduced an ultra luxury top-of-the-line V-16 engine car in 1930. 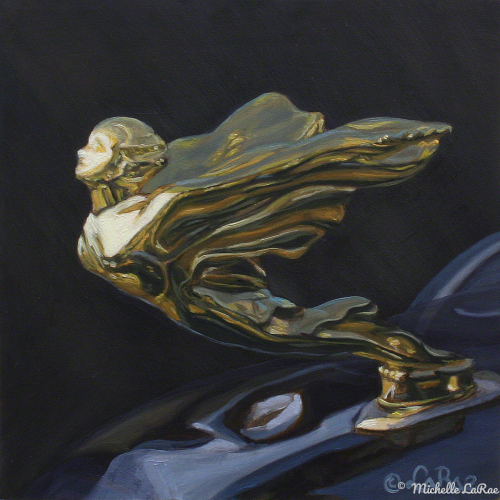 With her hair flowing gracefully, the "Cadillac Goddess" hood ornament was reminiscent of a mermaid. She wore a dress with a shell shaped train. The 1930 Cadillac Sixteen was regarded as one of the finest automobiles of the pre-WW-II era, with one example commanding a $500K price in 2004. Ultra luxury and magical style await you. The Plymouths used the tall ship as their symbol to show the grace and power of the vehicles they made. 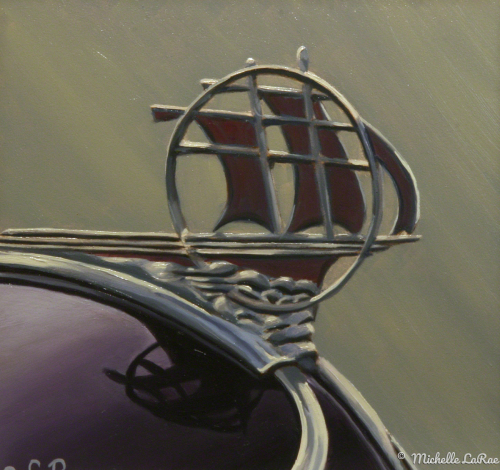 This highly stylized tall ship was the most beautiful of all the Plymouth hood ornaments. The new 1934 Plymouth had a starting price of $585, and the beautiful hood ornament was a $3.50 option; well worth the price! Michelle LaRae (the artist) lovingly pilots her own 1934 Plymouth PF 5 window coupe. Like past explorers of the open sea, prepare for adventure on the open road. This is the Moto-meter for the very popular Ford Model A. 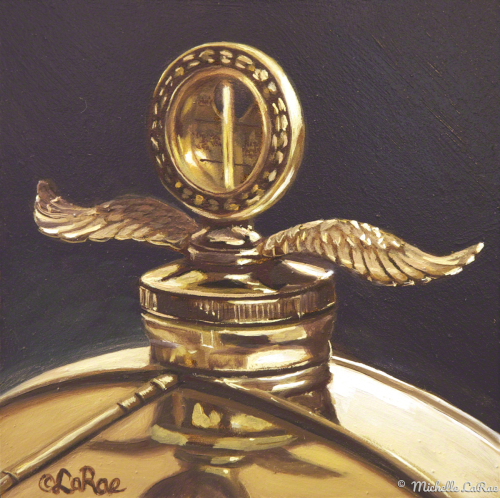 A Moto-meter is a radiator cap that also has a thermometer on the back. The thermometer is used to determine the coolant temperature of the engine. Leave it to the industrious Henry Ford to make one part with three functions; A Moto-meter, a radiator cap, and of course a very attractive winged hood ornament. Check the temperature; it's a great day for a drive! 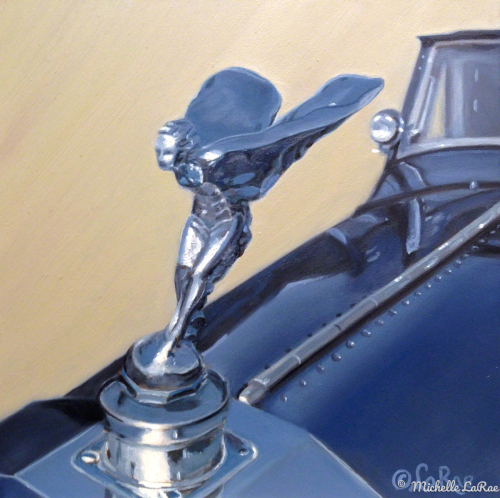 English sculptor Charles Sykes called it "A graceful little goddess, the Spirit of Ecstasy, who has selected road travel as her supreme delight and alighted on the prow of a Rolls-Royce motor car to revel in the freshness of the air and the musical sound of her fluttering draperies." 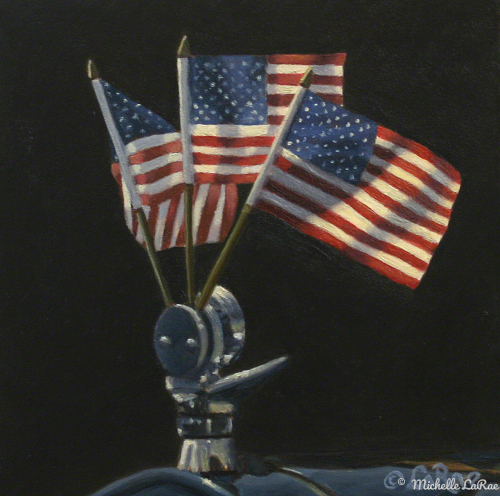 A patriotic Ford Model T, flying American flags proudly!